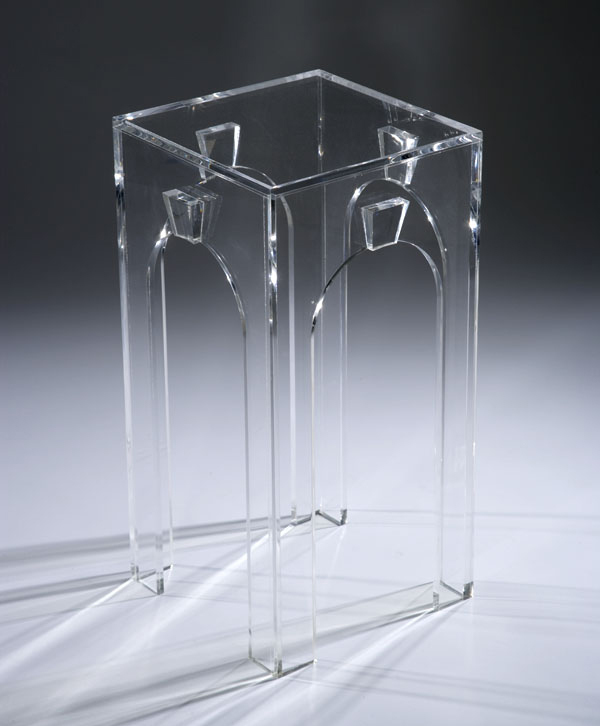 If I were to list the must-have pieces of furniture that every home should have, drinks tables would rank near the top. And note I said "tables", not "table". 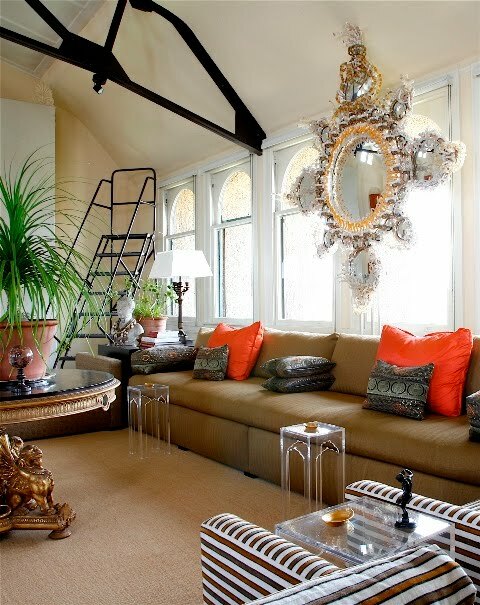 After all, you really should have some type of table near every armchair and sofa. Is there not anything more annoying than having a glass of wine or iced tea in your hand and then realizing that you're going to have to sit there and hold it because there are no tables close at hand? The only downside to this, of course, is that all of those little tables scattered around can lend a bit of a cluttered look to a room. 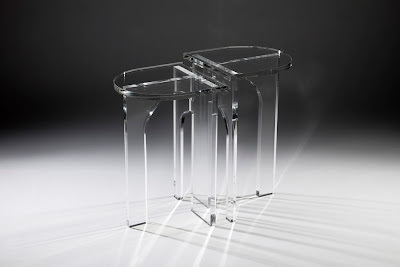 This is why I'm a fan of White Webb's Clearly Classic line of occasional tables. First, they're made of lucite which means that they don't add a lot of visual heft to a room. 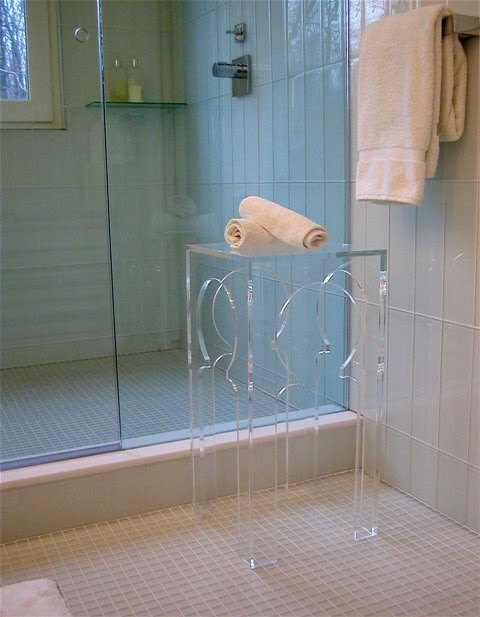 You can have all of that function without having to worry about how to incorporate the form into your room. 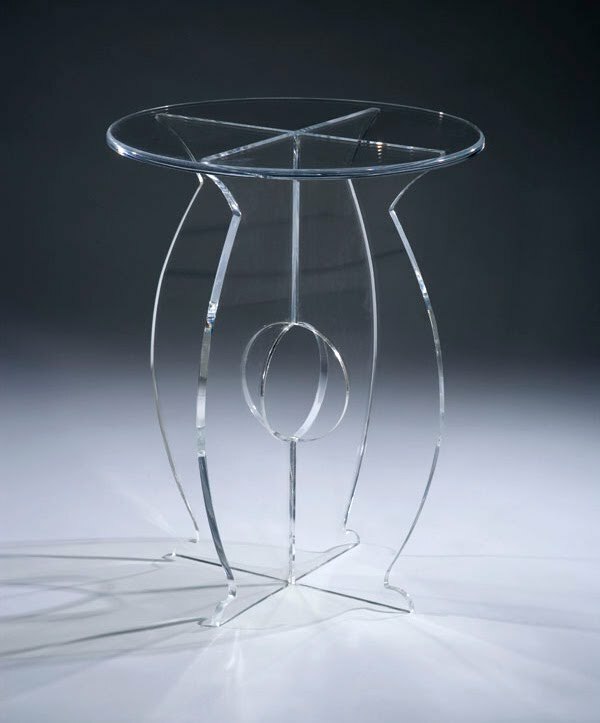 The other thing that captivates me are the tables' architectural shapes. They're exotic yes, but thanks to the lucite, it's exotic-light. These tables will work in any interior. I've written about Clearly Classic before, but the reason the line is on my mind again is because the tables are now available at Donghia showrooms across the country. Creative Director Chuck Chewning has been breathing new life into Donghia while still staying true to the vision of its namesake, so I think it's only fitting that Matthew White and Frank Webb have partnered with the firm. 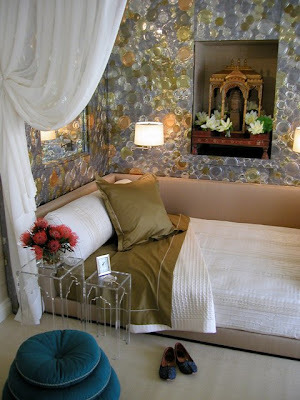 (By the way, I think it's time for an Angelo Donghia revival. Just my two cents.) And in honor of the new partnership, Matthew and Frank have designed the Arc Table (seen above), a piece inspired by the classic Roman arch. So, which one will it be? The Arc? Akbar? Maybe Pasha? I'll take one of each. That way, my guests will never be table-less again. Many of you probably remember White Webb's room from Kips Bay a few years back. Jennifer -- love that description, 'exotic-light.' That's such a great point, about how the subtlety allows them to fit in all sorts of places. I think Melissa Rufty used one in a boldly colored, rather layered room. I love the akbar table, exotic-light is right up my alley. The Akbar definitely has the Mughal arch. Did you know that Akbar was the grandfather of Shahjahan who built the Taj Mahal? 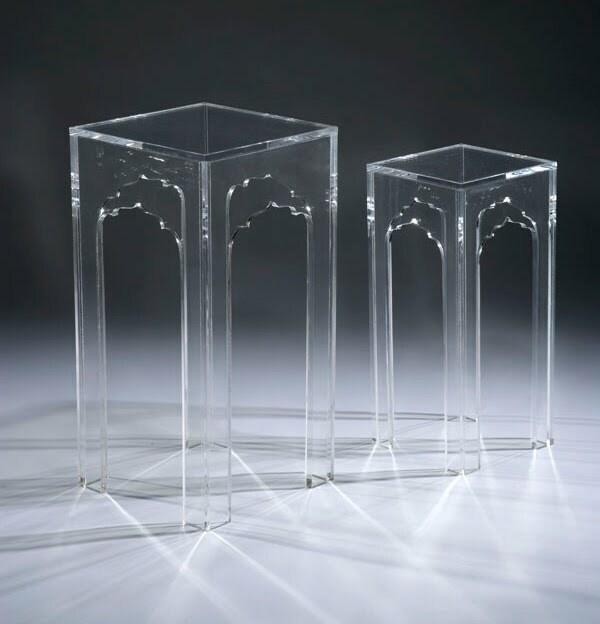 Just like White Webb themselves- these tables are Clearly fabulous!!! I love these tables. Classic! Ahhh!!! (that's a squeal) - these are so fantastic! 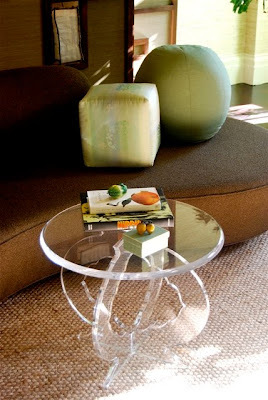 I love lucite. 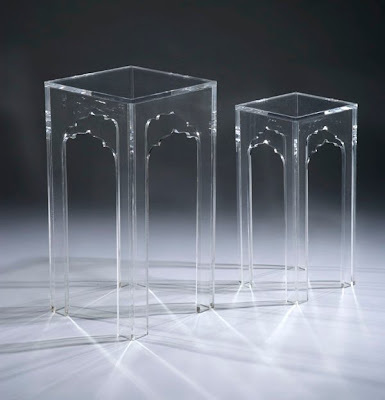 I have a lucite problem - and these are just amazing. 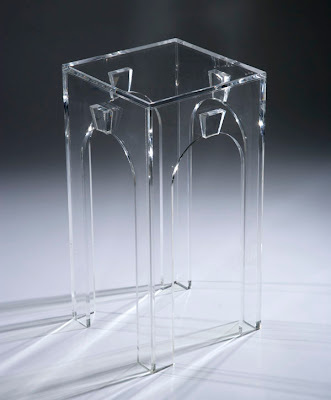 So many of the pieces available right now are boxy - which is fine, but the architectural approach is just charming. If one is near-sighted or old, a clear table can be a problem! Jennifer - Thank you for posting these! (The Akbar and Pasha are my favorites!) 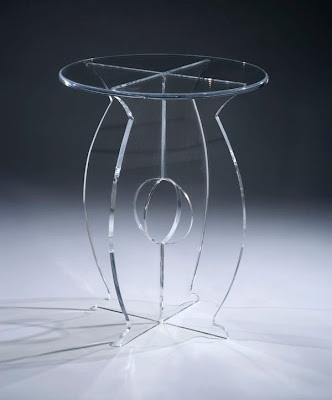 I am going to check them out at Donghia a.s.a.p. I do like the pedistal. 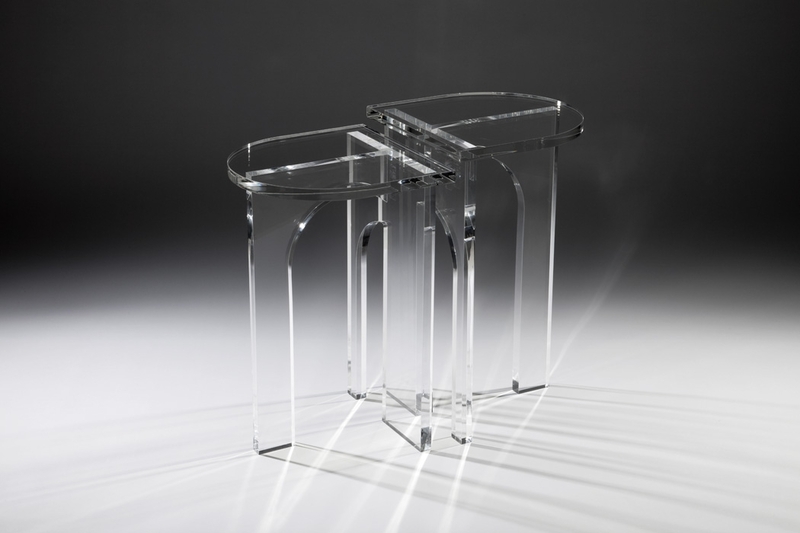 just saw those today at donghia, love them! I like that most have no applied ornament(except my favorite) just character lines. My favorite is the Hadrian with cute little keystone. These are going into the redecorating file. 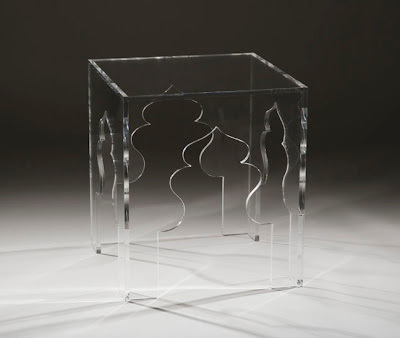 I love how these little tables would work in a room. I will need some tables when I finish my furnishing my living room and the idea of them not cluttering my room would be great. I will have to keep these in mind! Love lucite. did you see the one in the wisteria catalogue?